Green Bay Glory offers the highest level of amateur competition to the top female soccer players in Green Bay and surrounding areas. The team was formed by a group of passionate leaders in the soccer community with a shared mission to provide an avenue for female athletes to create glorious moments on and off the field and bring the community together. 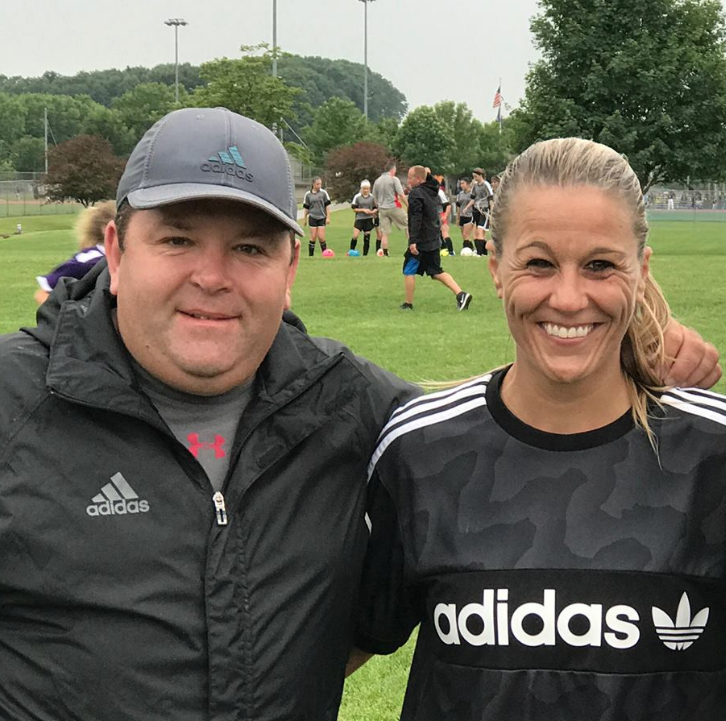 The formation of the team was inspired by former WPSL Player Kerry Geocaris who followed a childhood dream to play professionally and made a comeback at the age of 39 as a member of the Milwaukee Torrent. After Kerry’s season with the Torrent, she returned to her hometown to play for the newly formed United Hurricanes Women’s Premier team formed by Eric Gebhard. Gebhard put together a high quality team with players across the state only to experience a number of forfeits from teams unwilling to travel to Green Bay. Out of frustration the team was pulled from the WSL and Geocaris said it was time to go bigger. After seeing little to no advancement in opportunities for female soccer players after twenty years, she decided it was time to create some for young athletes in her community. Geocaris and Gebhard shared the vision and passion for putting Green Bay on the map and elevating the game. They enlisted the support of members from the soccer community and applied to the Women’s Premier Soccer League (WPSL), the nation’s largest women’s soccer league in the world. As word got out, excitement and support came in. Soon the team behind the team grew to many as people saw the need and jumped on board to make this team happen. We now have a full team behind the team to ensure the Green Bay Glory is Glorious! We will create and fuel a life-long passion for the sport of soccer. We will encourage the growth of soccer in our community and enhance the level of play available to area athletes. We will encourage an environment in which we nourish social, emotional and physical health. We will foster personal growth and development of life skills by engaging our athletes in soccer while providing a safe, healthy, positive environment. We will instill an appreciation for the benefits of hard work, motivation and persevere in both winning and losing situations. We will connect aspiring youth athletes with authentic local role models. We will promote gender equality and long term, empowerment of females in our community. 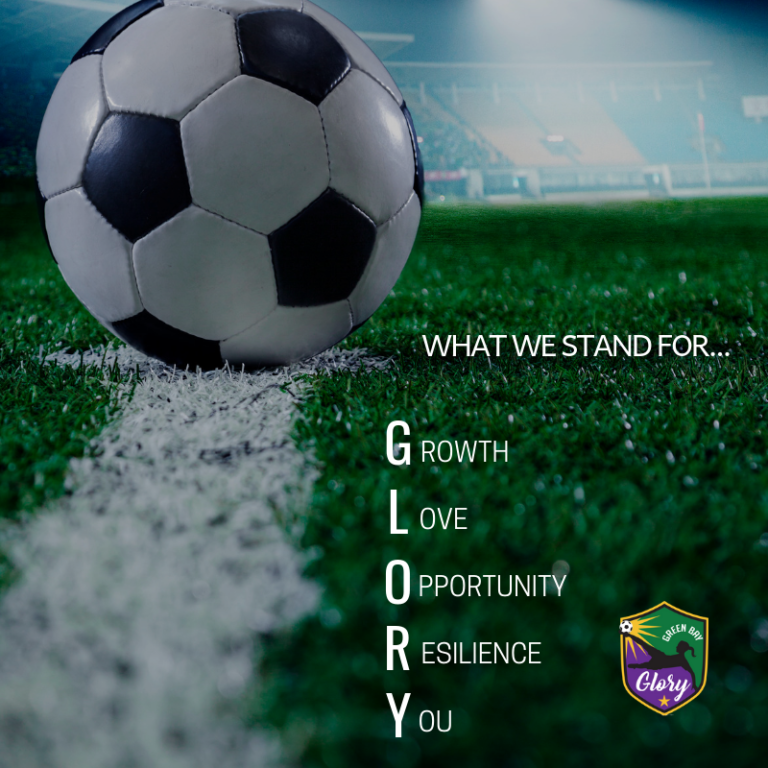 The name “Glory” was chosen to symbolize those moments in sports of where complete joy, accomplishment, and unity are shared. Our mission is to provide an avenue for young female athletes to create glorious moments on and off the field and bring the community together. Our Mardi Gras themed colors give nod to our hometown and represent the fun and joy found in the game we love. The black silhouette/shadow in the logo represents the “legacy you leave behind or the mark you leave in the world” and the goals we set out to accomplish. The white silhouette will be used for our youth camps and give young athletes a blank canvas to encourage them to paint their colors and find who they are so they can leave their mark. Providing an elevated environment that fosters continuous GROWTH. Operating from a positive place so players can truly harness the LOVE of the game. Providing OPPORTUNITIES for female soccer players . Teaching transcendence and building RESILIENCE. You being YOU and bringing YOU to the game.